I’ve been busy the past few days, getting my Christmas stuff ready to go. 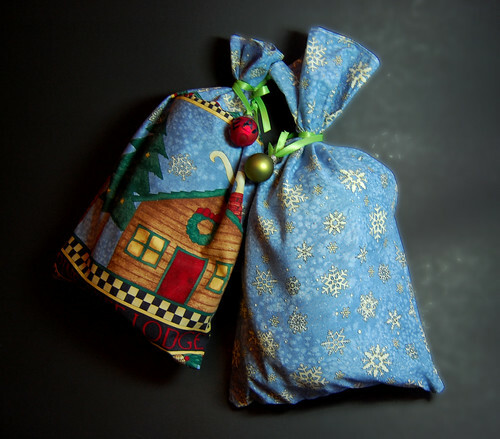 I actually did wind up making some fabric bags to put my presents in. I think I made 6 altogether. I thought they came out pretty decent, and I used up about a yard and a half of fabric. It was nice to take the sewing machine out for a drive, too – I’m looking forward to doing more sewing in the next year. I’ve taken about a 2 1/2 year hiatus from sewing and quilting, which I think I needed to do. Now that I’ve had some time apart, I think I have a new perspective and different goals regarding sewing than I had in the past. But more about that after Christmas. I also spun up the fun roving ball set I had combed up the other day from the miscellaneous fibers Travis and I picked out. It’s called Juvenile Delinquent. It’s spun, for the most part, really low-twist, and has fun random mohair locks trying to escape from the skein. I had over 6 1/2 ounces and about 200 yards of it. 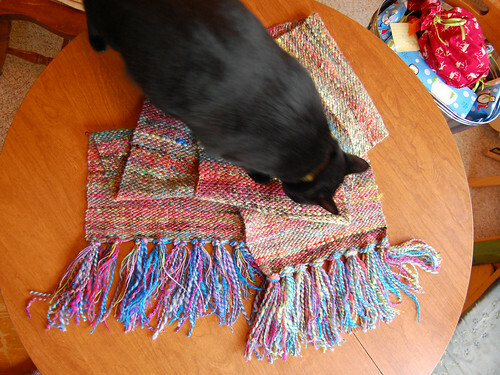 I say “had” because after the yarn was finished blocking, I immediately got a warp on my loom and started weaving with it. About 4 hours later, I had a new scarf! 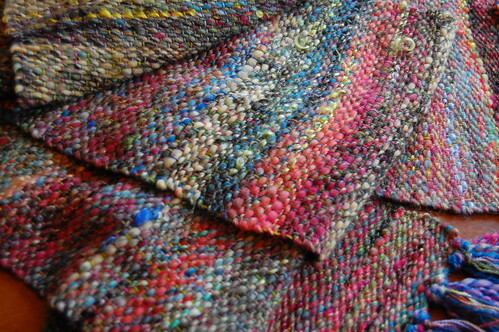 It’s very glam rock – the mohair gives it these nice random shiny areas, and the scarf is almost ridiculously wide – 11″. I love it. Ellie loves it, too. 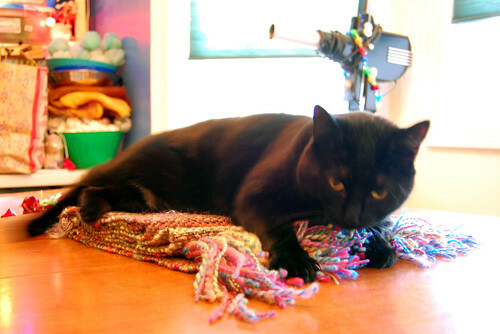 When I had it on the table to try to photograph it, she kept jumping up and laying on it. Also, you can’t really see it here, but I’m wearing a new shirt Travis got me for Christmas. He got it from an Etsy buyer called Look For Fiddleheads. Here’s the design on my shirt. I love it. I am all about Etsy and am going to try to honor the Buy (or make, in my case) Handmade pledge as much as possible next year. Travis and I leave for our Christmastacular family adventure tomorrow, so probably very little (if any) blogging for the next 4 or 5 days. Hope everyone has a happy holiday season! 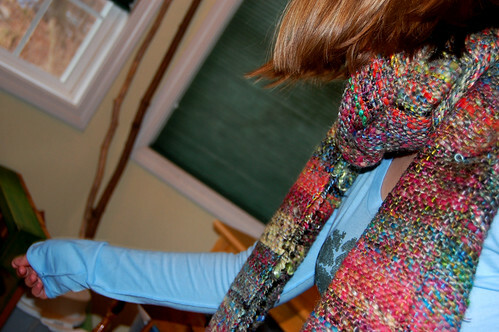 PS – Wish me luck – god willing, I’ll be hitting Mass Ave Knit Shop’s post-Christmas Sale. All yarn is at least 30% off. Travis and I accidentally found ourselves in the midst of it 2 years ago – I had no idea there would be a sale going on, and I think Travis died a little bit inside. 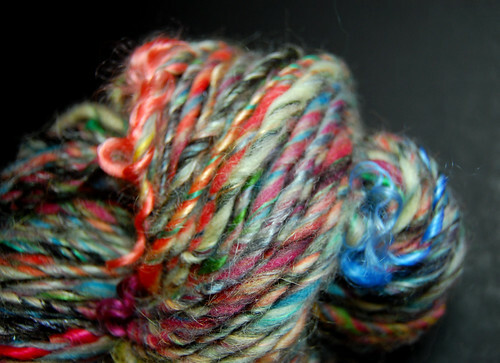 But I’m prepared this time, and my only goals are Malabrigo – lots of it – in almost-solid colors (for colorwork!) and some new needles. Let’s see what actually makes it home with me. Wow! I love the scarf 🙂 What did you use for the warp? 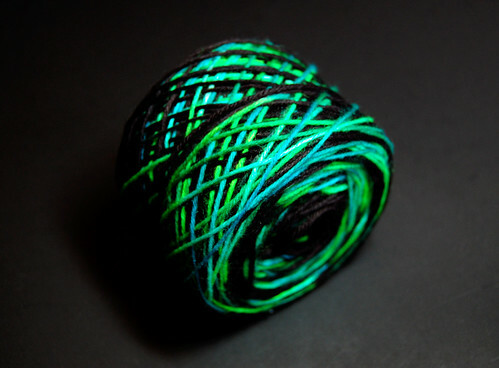 I’m thinking of trying my first weaving project and the thought of spinning my warp yarn makes me a bit timid. I’m not sure I can get something strong enough. I guess I’ll just have to start trying and see what works. Thanks for the inspiration. I hope you have a great time at the yarn sale. Your are just so darn talented. your sew, knit, dye, have one of the most beautiful smiles I’ve ever seen. And best of all I’m blessed to call you one of my good friends. You’ve gone and done it now! 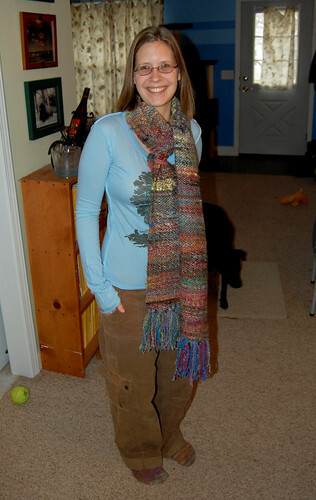 I love that scarf and now I must go out and get a loom! Well, I’d better work and save a little and then go out and buy a loom! That cat has love for the scarf in her eyes! That scarf is beautiful! Totally rockstar.